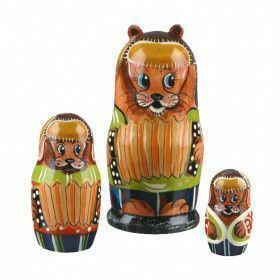 One of our top selling lines of nesting dolls is our "Mans Best Friend" collection. Everyone has a favorite variety of dog, from Dachshunds to Terriers to Labradors and more, we have a nested doll for those looking for a unique way to honor their favorite puppy, or just a great gift for that dog lover. Our canine stacking dolls are true works of art that we're proud to offer, and the artists are proud to create. Woof!